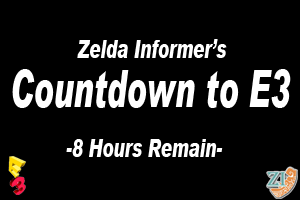 If you’ve been following us during these past weeks, you may have found yourself wondering: “Hey, if Zelda Informer is sending Alex to E3, why hasn’t he contributed anything to the E3 Countdown?” It’s a wise question, to be sure. Besides the fact that I’ve just been insanely busy with school and other life obligations, I’ve come to learn something about E3, and that’s that it’s not about the attendees. We’re just there to serve as witnesses. In truth, it’s about all of you: those who follow your favorite games online, who build and run and participate in fan-site efforts like this one. It may sound corny, but it’s true! That said, since media grunts like me are still an important link in the chain in terms of bringing the information at E3 to the masses, it’s time that I asked you guys the really important question: what do you guys want most out of me while I’m at the conference? Number one on my priority list is obviously going to be getting my hands on whatever Skyward Sword demo is being shown. We’re a Zelda site first and foremost, and so it’s really best for us and our fans that we make sure we have the goods on all the upcoming Legend of Zelda titles, like we’re already doing with Ocarina of Time 3D. I don’t know what restrictions they’ll have on play time, and some E3s have multi-layered demos showing off several portions of the game, so I’ll do my best to experience as much as I can. You guys deserve as much. Once I return to the home base, I’ll deliver my detailed impressions of the game, covering everything from the Wii Motion Plus control scheme to the general look and feel of the game’s world and content. I’ll be sure to note any story tidbits I pick up from Nintendo reps on-site as well. Depending on how comprehensive my exposure turns out to be, I’ll throw together a “walkthrough” of sorts for the demo that’ll give you a little taste of what the final game’s going to look like in the end. My next stop’s going to be the demo stations for Nintendo’s new console – because, of course, how in the world could we justify our expanded Nintendo coverage if we don’t even make a concerted effort to give it a go? I’m expecting fairly long lines for this one, since it’s sure to be the highlight of Nintendo’s press conference. I’ll try out as many of the features of the console and its controllers as I can – as well as probing Nintendo reps for info that didn’t get mentioned during the main presentation. If there are any real game demos ready to play, I’ll be all over them – at least the one or two biggest games on the roster. After that, I’m envisioning myself going after Super Mario 3D, given that it seems like the big 3DS game for this year. Since the E3 attendee experience tends to consist of mostly waiting in long lines for demos, bear in mind that it’s entirely possible I may not get to everything I’d like to on Day One. Unfortunately I have a final exam on Day Two (believe me, I tried to reschedule, but those darn university regulations don’t budge for anybody), but if there’s anything huge that we absolutely need to get impressions on I’ll make my way back for more on Day Three. But based on everything we know about Nintendo’s upcoming software, either for 3DS or Wii, what do you guys want me to try? Can’t wait for Paper Mario or Mario Kart 3D? Wondering about StarFox 64’s 3DS remake? Wishing you had a good taste of Kid Icarus: Uprising? Or would you rather I focus mostly on new announcements? Honestly, it’s all about you guys, so I’m aiming to bring you the news you want to see. Leave us a comment and let us know what you want from our E3 coverage!